Looking back, these words define my life. I told my Dad I wanted to work in a carnival. He helped me set up a back yard carnival. We charged 5 cents for rides in his “camouflage dodge”, goat petting, chicken chasing, and a fish pond. I made a hundred bucks that day, and an entrepreneur was born. As I got older, no one told me that although no one in my family had ever graduated from college, I couldn’t. And so I did. And then, in my mid 20s, I thought it might be fun to open a health club. Thank goodness there was no one in my life who told me that was a bad idea. For almost 20 years, that club, Anatomy Academy, was the “Cheers” of fitness in Salt Lake City. Relationships and memories were formed there that impacted the lives of thousands of people. And now…I just filed paperwork to form a non profit, with the hopes of getting help in my mission of “Teaching Yoga Everywhere”. Don’t tell me I can’t, or how hard it will be. I am ignorant enough of the impossible. 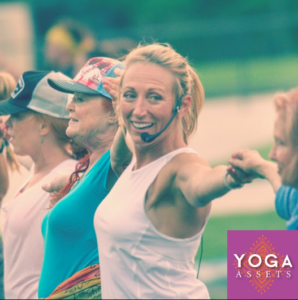 With the help of the trainers and graduates of our 500 Hour Yoga Teacher Training, we will be training teachers to bring mindfulness practices into their classrooms, and training prisoners to teach yoga to their fellow inmates. There are too many nay-sayers in the world. Too many Dont’s, Shouldnt’s and Cant’s. Stop listening to them. Start being ignorant of the impossible. Start being the Dad who helps the kid throw a carnival. Start being the person who says ‘go to college’, ‘start the business’, ‘form the non profit’, ‘quit the soul sucking job’. Nothing is impossible. We’re in this ride together, and God has been waiting for centuries for YOU to do this very thing. Thank you Cynthia for being a Light Bringer in this world. I am so grateful to have you on the path with me. Anything is possible!! !